Lets take a trip back in time. 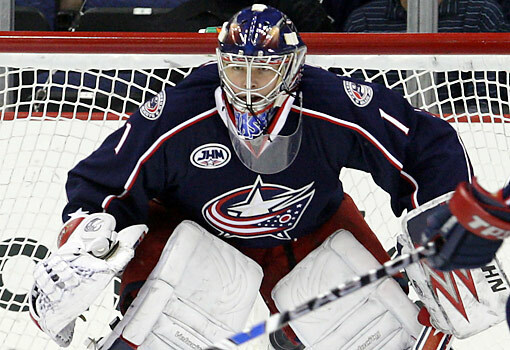 It is April 8th, 2009, and the Columbus Blue Jackets have, for the first time in franchise history, locked up a trip to the Stanley Cup Playoffs. Now ump to the end of the the regular season, Blue Jackets' goalie, Steve Mason, has won 33 games, 10 in shutout fashion, while posting a save percentage of .916 and holding a goals against average of 2.29. A performance that proved good enough to win Mason the Calder Trophy as the leagues top rookie. Jumping back to the present, we know that the Blue Jackets would go on to get swept by the Detroit Red Wings in the first round of the playoffs, cutting the Jackets' playoff high short. But at that time, things seemed to be looking up for a young franchise that constantly gets buried in the tough central division. However, in the two seasons since breaking that barrier and making the post season, the Jackets have failed to qualify for the playoffs finishing both regular seasons well outside of the playoff bubble. Whether or not the city of Columbus, Ohio will see any post season action next season will depend on one thing, the play of Mason. After General Manager Scott Howson snagged Jeff Carter and James Wisniewski during the off season, Columbus will finally have a heart beat on the offensive side of the puck and not have to rely up captain, Rick Nash like they have done so frequently in the past. So offensive should no longer be the scapegoat in Columbus. This leaves all eyes on the play of Mason. After his Calder worthy season, Mason has been average at most, posting a 20-26-9 record with a 3.05 goals against average and a .901 save percentage during the 2009-2010 season. Last season was not much better, when he went 24-21-7 with a 3.05 goals against average and a .901 save percentage. Not numbers that will take a team into the playoffs that's for sure. Mason will have to step his game up if the Jackets hope to make a run at only the second playoff appearance in franchise history. The offense is finally present in Columbus and if they continue to lose, the play from Mason between the pipes could be the biggest factor. If Mason does not perform his time in a Blue Jackets uniform may be coming to an end.